Burnt Cream Take three gills of good Cream the yolkes of ten eggs beat them them well put 2 spoonfulls of orange flower water Sugar to your taste grater a lemon rind in it put it into a [tooing?] pan over a stove stirring it all the time untill it be as thick as Custard power it into a China dish give the dish a shake then brown it over nicely with a Salemander if you please this you may add one pound of double refined sugar and a gill of water boil this in a silver sause pan over a clear fire till it be candy high so pour it it over your cream. 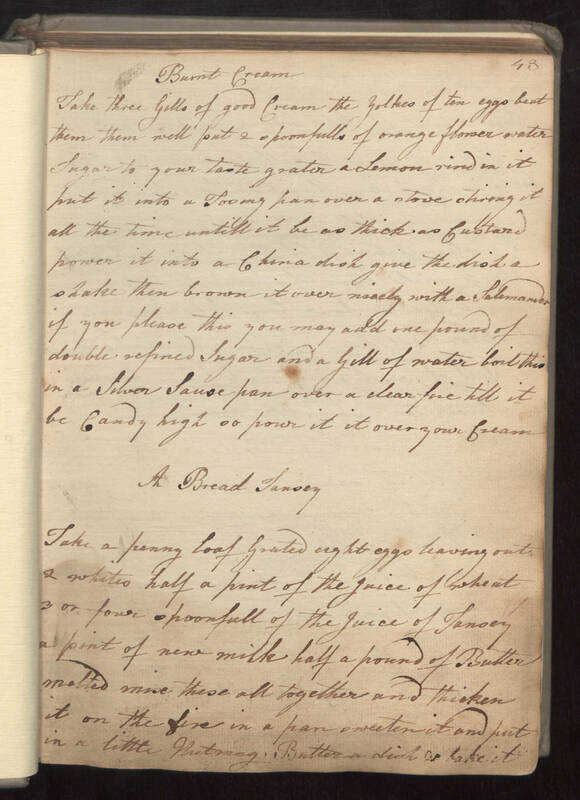 A Bread Tansey Take a penny loaf grated eight eggs leaving out 2 whites half a pint of the juice of wheat 3 or four spoonfull of the juice of Tansey a pint of new milk half a pound of Butter melted mix these all together and thicken it on the fire in a pan sweeten it and put in a little nutmeg. Butter a dish & bake it.